Widely considered one of the NFL’s top passers, Andrew Luck showed why in 2016. Despite missing a game, Luck finished as the number four quarterback in fantasy with 4,240 passing yards, 31 touchdowns, and only 13 interceptions. 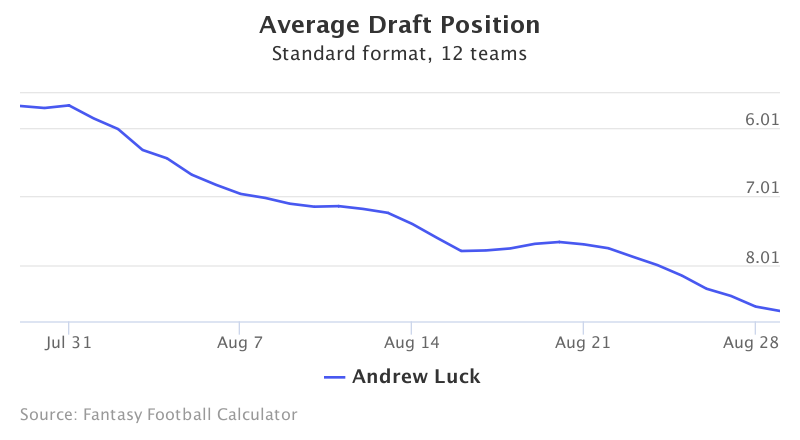 Luck’s fantasy football ADP has fallen roughly two rounds over the past month. Data is from 12-team standard mock drafts. Going at pick 8.08, Luck’s stock continues to fall, with his week one status up in the air. While Luck has been a top passer throughout his career, his recent plummet down draft boards stems directly from his health. This offseason Luck underwent surgery to his throwing shoulder. While the Colts have remained optimistic, Luck’s week one availability has become unlikely. With no definitive timetable for Luck’s return, fantasy drafters are wisely beginning to shy away. On top of his health concerns, the Colts have shown no urgency to protect their signal caller over the course of his career. The Colts have ranked 2nd, 3rd, 4th, 2nd, and 2nd in quarterback hits allowed in each of Luck’s first five seasons. To compound their offensive line woes, they recently lost starting center Ryan Kelly for at least half of the regular season. Will Luck Remain Elite in 2017? While this environment appears unfriendly, Luck has thrived in this type of situation in the past. Excluding 2015 when Luck only played seven games, he has passed for at least 3,800 yards and thrown a minimum of 23 touchdowns each year in the league. While Luck may face pressure often in 2017, he has shown the ability to overcome this in the past. 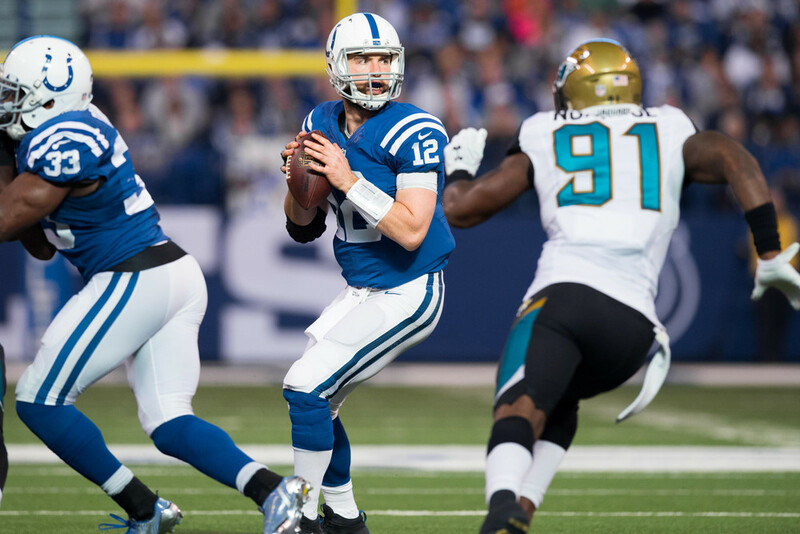 Currently going at pick 8.08, Luck provides a sneaky value at the quarterback position. Coming off the board just behind Kirk Cousins and Cam Newton, Luck still remains risky in this range. However, if Luck falls any further, his upside cannot be ignored. Look to pair Luck with a late round option and secure one of the league’s premier passers at a value this season.